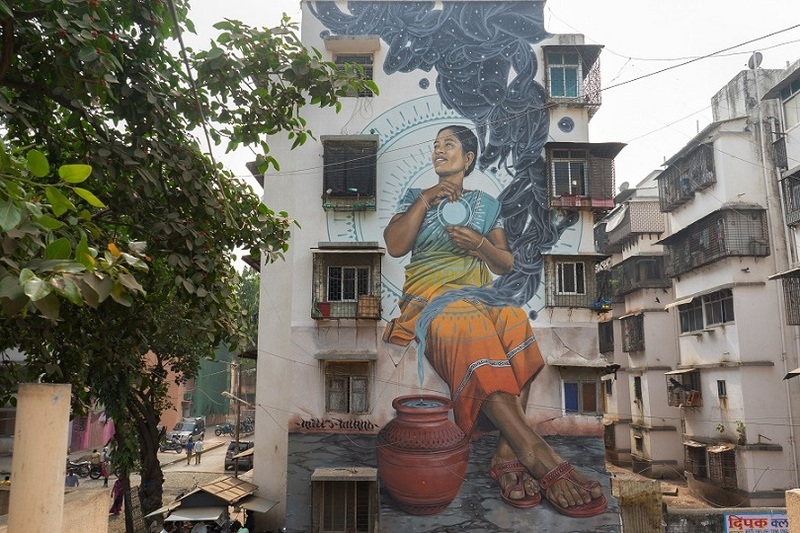 Home / Indian Fashion / Why Does A Residential Building In Mahim Feature A Larger-Than-Life Mural Of A Rustic Indian Woman? When one utters the word ‘art’, what immediately comes to mind? Canvases featuring abstract strokes of paint displayed in palatial spaces? Patrons in full regalia, sipping champagne out of delicate flutes? The common man only being able to earn a fraction of the selling price of the painting in his entire lifetime? These were the nagging thoughts at the back of the minds of four artists who decided that they didn’t want art to remain in the elitist confines of galleries and auction houses anymore. The created St+art Foundation, an initiative supported by Asian Paints, that set in motion a much-needed urban art intervention. St+art Festival enlists the help of renowned Indian and international artists who embark on a mission to transform city localities. 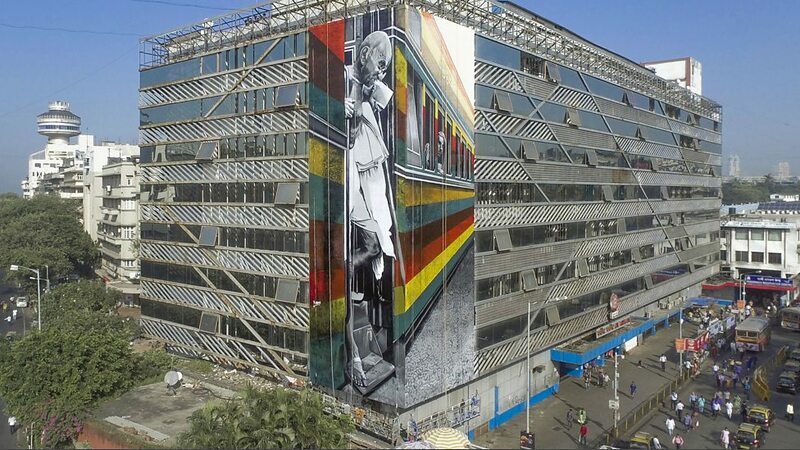 With Sassoon Dock, Churchgate and Dharavi getting a much-needed dose of art last year, the transformation baton was passed on to Mahim East in 2018. We spoke to Mexican artist Miles Toland whose practice merges human forms with transcendental designs that are structured by geometric patterns. 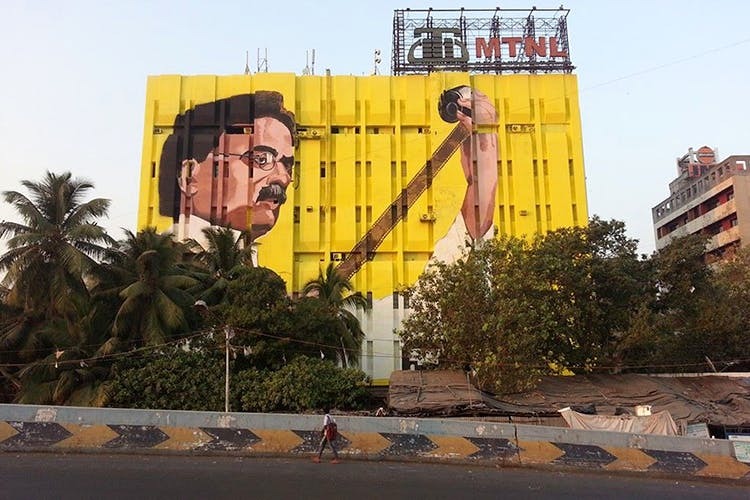 His was the first mural that was commissioned as part of the St+art Festival 2018 edition, which commenced in November and will go on till January. I got into street art as a form of rebellion, as a way to speak from my heart without having any limitations. It was only later that my art evolved into a defined message with a purpose. I began my journey in street art with graffiti but it soon turned into a lifestyle rather a Sunday hobby. I was doing hip-hop and dabbling in spoken word. My works tend to focus on subjects that are in a state of peace or reflection because I seek to evoke a sense of calm in people who view my art. I’d like it to make them pause for a second and see a larger perspective. The art is deliberately ambiguous. I want people to stop in their tracks, look at the elements and question how they relate to each other. The underlying intention behind painting a woman in a colourful sari with a matka at her feet was to honour the local culture. If you look carefully, you’ll realise that the lady literally embodies the sunset and is staring into the cosmic clouds. From my experience, it’s been a lot more casual and supportive here. There are fewer permissions and requests involved, and it’s also easier to procure walls in India. When I first started painting in the country, we would just work on abandoned buildings or walls that didn’t seem to have any purpose. We only got into trouble once when we were caught writing on a wall that we didn’t have permission to work on. So, I just started asking for consent beforehand and realised how easy it was to get approval in India if you just requested nicely. It also meant I could paint longer hours with the entire neighbourhood backing me. In the U.S., it’s hard to walk up to someone and ask them, “Can I paint your wall?” There’s greater resistance there since people are apprehensive about everything. I like Cryptik’s calligraffiti style. There’s a fine arts painter called Brad Kunkle who captures serene and dreamy imagery; I love his work. Sainer has always been inspirational as well. Finally, I would like to mention PichiAvo — they do a really cool blend of 2D form and 3D figures that I can relate to because of the traces of geometry in my own work. It’s a piece called It Was Only A Dream that I painted in Sacramento, California. I think what makes it special is the context — a floating girl who’s sleeping in her bed but is in a really deep dream-state. The dream, however, feels so real to her that she is actually starting to float off her bed. I wanted to propagate the idea that dreams affect our reality and reality affects our dreams. 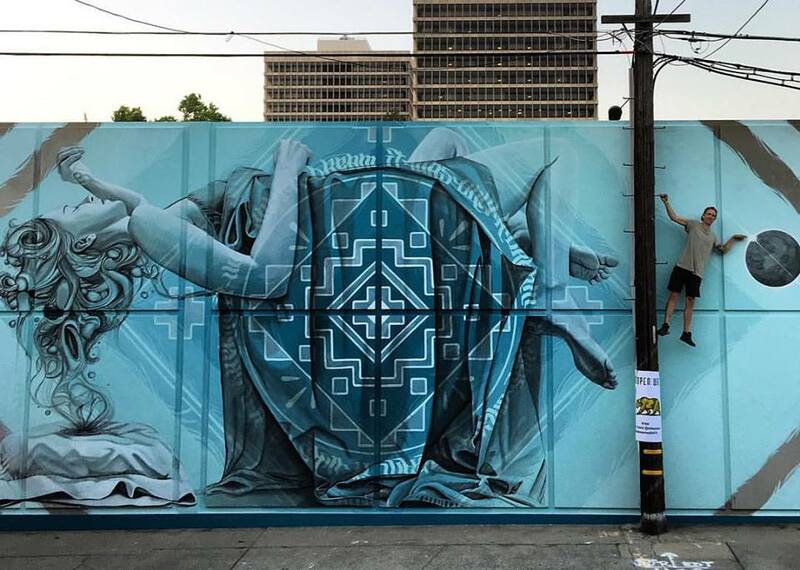 And with the all-blue colour palette, the mural is beautifully balanced between being peaceful and surreal. Next Ready, Set, Shoot! : Crimson’s Upcoming Wedding Wear Collection Hits All The Right Notes!